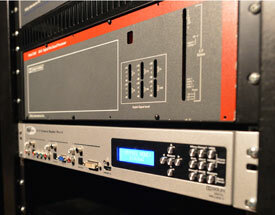 Cinematronix is the largest provider of technical services and equipment for commercial cinemas in Canada. They are directly involved with more than 2000 screens across the country and play a leading role in digital technology in support of commercial cinema exhibitors. With the growth in its business, the company needed a better way to manage technicians in the field. The existing paper system used to report on their jobs and activities was causing delays and required too much administrative overhead. Cinematronix selected Flowfinity to implement a mobile solution to report on time and materials, integrate with existing payroll and billing systems, and provide real-time information about activities in the field. In conversation with Kevin Eagle, Principal at Cinematronix, he explains why Cinematronix chose Flowfinity software and how it has impacted the business. What challenges were you facing previously? At the time we were using a paper and spreadsheet system for managing the activity of satellite technicians and materials used on jobs across the country. Handling the paperwork was labor-intensive, and we were seeing a lot of inconsistency in job reporting. Some technicians would type their reports into spreadsheets and email them in, while others would use our manual triplicate carbon copy system, keeping one copy of the job report and giving the other copies to the cinema and our head office. The paper system had inherent delays and resulted in errors. Quite a bit of time was spent keying in data from the paper forms, and time had to be spend interpreting and clarifying handwritten reports. We also had to make time-consuming phone calls to technicians to coordinate activities. There were times when revenue was lost or delayed because tickets were left open for weeks or months. It was evident that we needed a better system. Why did you choose Flowfinity? The ability to customize workflow was an important requirement. We had a lot of options when setting up our solution because the software is so customizable. Going through our paperwork, I was able to identify common service items that we do on a regular basis and pre-populate lists and forms with those items, which saves time in the field. I liked the fact that Flowfinity gave the option to be managed in-house instead of in the cloud. Flowfinity also had a visible track record with existing industry references. "The Flowfinity system represented a radical shift for both our technical and office teams, with our field service personnel making wholesale changes to how they tracked and reported their work." How do you handle dispatch and work order management today? 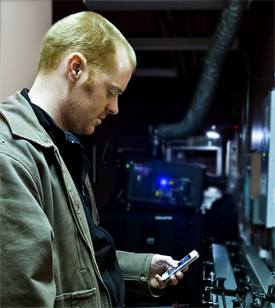 We deployed Flowfinity to handle service ticket dispatch and mobile reporting for all of the technicians servicing cinema projection and sound systems. Technicians track their hours, on-site activities and expenses within Flowfinity. Work tickets are either generated by our office, the regional technical managers or directly by the technicians. There are separate pages in the Flowfinity application to record their regular work hours, travel time, and associated expenses. They can access the system on their smartphones or on the web as soon as jobs are complete, instead of having to complete paperwork after the fact. Are you using notifications for real-time activity tracking? Yes, automatic notifications have made an impact on the level of customer service we can provide. As soon as a job is created in the system, Flowfinity generates an email notification to advise the regional technicians and the customer that the work has entered the system and that they will be contacted shortly. When the technician starts the work, they change the state of that ticket from ‘Dispatched’ to ‘In progress’, and the customer receives another email notification. At the conclusion of the work, the ticket is marked complete and a more detailed report is sent to the customer, which they appreciate. It also alerts the office staff that the job is complete so that they can bill it. Have you integrated Flowfinity with your existing back-end systems? We have an in-house Microsoft Access SQL database application that we use to manage our company data such as the customer list, P.O. system, quoting, repairs and exchanges, etc. We use Microsoft Access to read from the Flowfinity database to quickly generate reports such as billing and tracking our technicians’ hours for payroll. What are the most significant benefits of the new system? The Flowfinity system represented a radical shift for both our technical and office teams, with our field service personnel making wholesale changes to how they tracked and reported their work. With this shift to an electronic workflow system, we gained a lot of advantages like having a central dispatch and being able to go back to the field and easily find what the last technician worked on. We’ve seen a distinct improvement in productivity with the technicians entering their activities “on-the-go” as the work happens. We have achieved speedier processing and tracking of our past, present and future projects and technicians’ activities, and we’ve eliminated the majority of our paperwork. Overall, we can easily identify a sense of more control and productivity. We have seen better consistency and quicker turnaround on our billing. All of these benefits have supported the 50% growth of our company over the past 2 years. "We've seen a distinct improvement in productivity with the technicians entering their activities 'on-the-go' as the work happens." Do you have any plans to expand your usage of Flowfinity in the future? We plan to integrate an inventory tracking system within Flowfinity. When cinemas were all film-based, there were a huge variety of systems and we used to track tens of thousands of parts in a separate database. Now that the majority of the cinemas have been converted to digital, we are working on redefining our inventory system and managing the new parts that we need going forward in Flowfinity. Has Flowfinity given you a competitive advantage? The dispatch and email reporting has been well received by our customers. Flowfinity also helps to identify to our customers that we’re forward thinking and in touch with the new era of cinema as well as mobile technologies. With this shift to an electronic workflow system, we gained a lot of advantages like having a central dispatch and being able to go back to the field and easily find what the last technician worked on.